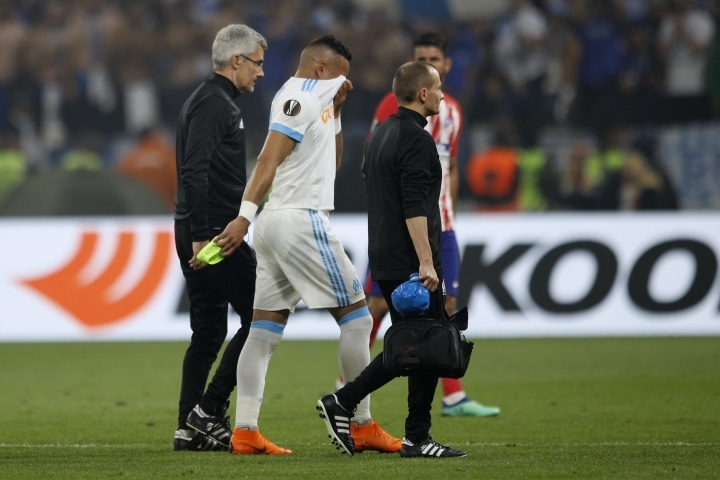 LYON, France — As midfielder Dimitri Payet limped off the field injured, Marseille's chances of winning the Europa League went with him. Marseille lost 3-0 to Atletico Madrid, an emphatic defeat which overshadowed the French club's bright start. Marseille was lost without the silky playmaker pulling the strings in midfield, and Atletico took complete control after he went off in the 31st minute. "You need your best players at their best level in this kind of game," Marseille coach Rudi Garcia said. "When you lose your captain it becomes tough." 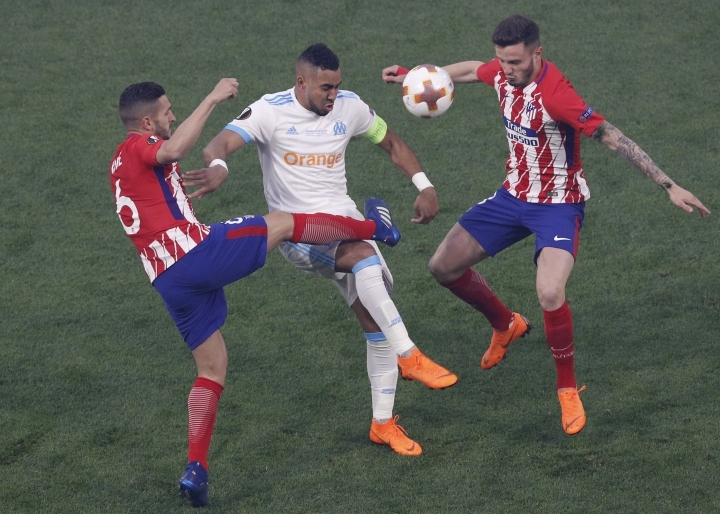 Pre-game, Atletico coach Diego Simeone had mentioned the need for his team to neutralize Payet. He is a slippery and gifted technician who elusively finds space from which to play devastating passes or hammer arrow-like shots from distance. 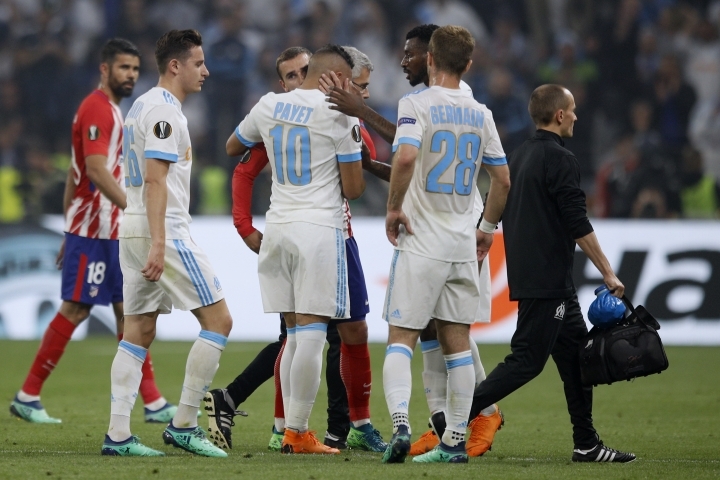 Despite carrying a thigh injury, Payet appeared to be sharp and played a great through ball for Valere Germain in the third minute — but the striker lofted it over. It was Marseille's best chance until substitute Kostas Mitroglou hit the post in the 81st, by which time it was already 2-0. "Even though Payet was not fully fit, he still almost set up a goal," Garcia said. "We also lost our best passer and our best free-kick taker." Payet could also be doubtful for the World Cup. France coach Didier Deschamps announces his World Cup squad on Thursday, and Payet had a strong case to be called up after his impressive form in recent weeks for Marseille. He is the French league's top playmaker this season with 13 assists and had three goals and seven assists in the Europa League, starring in the quarterfinals and semifinals. 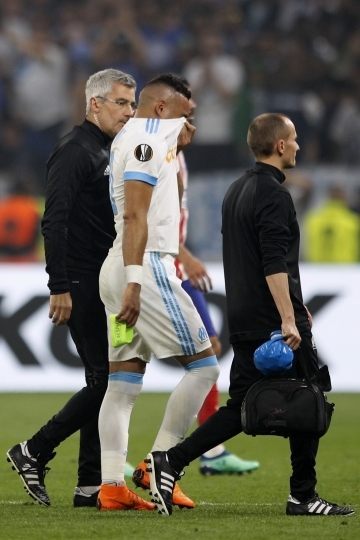 Payet was in tears as he left the field at Stade de Lyon and was consoled by teammates. He sat slumped on the bench as he looked on, helplessly. Without Payet's threat, Atletico's midfield was able to push up much more, less worried about protecting the space behind them. On the eve of the game, Payet had confidently predicted he was fully fit. But Garcia later acknowledged this wasn't the case. "He was getting better day by day," Garcia said. "We did tests this morning and he still had a bit of apprehension about striking the ball properly." While affirming Atletico deserved to win, Garcia lamented how tired his players were after a long a season which began with playoffs to even get into the European competition. "It was our 61st game of the season and the players are feeling it. With players at 100 percent we would have been able to compete more," he said. "But defeat takes nothing away from our journey to the final. France has got behind us and I'm proud of my players for that."